This is the fully crusted pizza slice made by the folks at Vinnie's Pizzeria in Brooklyn. Admittedly, Vinnie's has come up with some pretty solid pizza advancements in the past (the pizza on pizza on pizza and the pizza box pizza). But this? This is a step backwards. Who the hell wants that much crust on a slice of pizza? The only reason crust exists in the first place is to use as a handle so you don't have to finger the cheese and sauce. Raise your hand if you really like eating pizza crust. Now everyone look around. Everybody with their hand up is exiled from this Fantasyland I've spent so much time and effort developing in our collective brains. Think God banishing Adam and Eve from the Garden Of Eden, but way more serious. GO -- I can't even look at you. Just kidding, I don't care, here you can have my crust if you want. "Thanks!" *chewing* No problem. The dog didn't want it anyway, she only licked it for awhile. Thanks to Gabe, who's convinced pizza crust was originally invented not to be eaten, but rather set aside after eating a slice to keep track of how many you've had. *counting* I've had nine I feel ooky. Obviously, whoever wrote this piece has never eaten really great pizza. Great pizza is about the crust. Great pizza makers spend years perfecting their dough. Ignore this fool. Great pizza is about light, airy, yet crispy and crunchy, (but still chewy), yeasty, flavorful crust. Hey, F-you GW, and the rest of you crust haters. It makes me sick to see people throw it away. It's complete disrespect to pizza, and you don't deserve to consume the glorious food that it is if you discard such an essential piece. It's like leaving pie crust, or those little black crunchy pieces from an ice cream cake. Or the bark of a good barbecue - how dare you. You were probably all those odd embarrassing kids that had their mothers cut off the crusts of sandwiches. I clearly do not belong with this crowd. 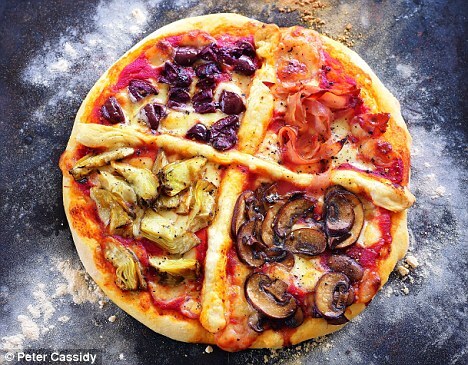 With that rant said, however, I would agree that this 3-sided crust is a bit obscene and an abomination of the cuisine. It's getting dangerously close to a calzone. Crust is the handle. You throw it away after. Read More: and all this time i thought you were a gifted student, bread, doing it wrong, eating things, i trusted you!, i'm mad as hell and i'm not gonna take this anymore, nope, opinions, pizza, taking a step back, that's not how you do it, this is an outrage, what have you done? !, what the hell is going on here?